Born of missionary parents in Papua, New Guinea, Abigail Caldwell leaves her beloved Inisi tribe in 2088 to save their lives. After learning everyone in the village is dead, she returns to the United States where she encounters a culture devoid of Christianity. Technological advances in all areas of life seem to hold amazing promise for the future, including the end to physical death. Abby soon discovers the dark side of this utopian scenario that threatens mankind's soul. Best-selling Author, David Gregory, gives us a tale so chilling because it highlights the dangers of technology in the wrong hands. When greed enters the picture, people will stop at nothing to obtain wealth. I also found much food for thought reading his take on why Christianity dwindled in the United States, and how his characters got around the laws in their presentation of the gospel. 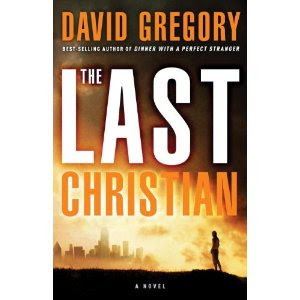 This novel kept me engaged and emotionally connected to Abby and her love interest, Dr. Creighton Daniels. Please note: The review copy of this book was provided by Waterbrook Press. No compensation was received by this blogger. A copy of this book may be purchased at Random House's website. A giveaway copy wasn't provided. In view of this, I will extend my giveaways for Happy Blogoversary Month into June. Oooh, sounds fascinating! Thanks for the review. Sounds like a super interesting read. Thanks, Susan! Very interesting. The review makes me stop and think. In many ways this book was scary because the scenario could happen. The author did a good job showing Abby's disorientation, although she was a quick study. This book made me stop and think. Technology is not good or evil, but its impact depends on the character of those using and controlling it. I'm hooked... We (our church) have missionaries in Papua, New Guinea. Oops, baby calls... gotta run! This was a spine-tingling book. He had scenes in New Guinea and did a wonderful job with setting. It's so interesting to see Christian works tackling the challenges of modernity. Thanks for the post! What an interesting premise! Thanks for the review! Thanks for visiting and commenting. I post here Monday, Wednesday, and Friday with an extra day thrown in here and there. It's sure not your same-old, same-old story. I was shocked by the ending, but won't give away any spoilers. Did this book kinda scare you, Susan, or make you bolder in your witnessing and prayers? I like the name Creighton. I love the name, "Abby." Fair warning, this story takes some wicked twists and turns. It didn't scare me into silence. The scary part comes from knowing there are people out there developing this technology. I did a Swagbucks search, and people are actually taking this seriously. I thought Creighton was an original character name. I wonder where he gets his ideas.